Small drone shows up on White House lawn, security problem. 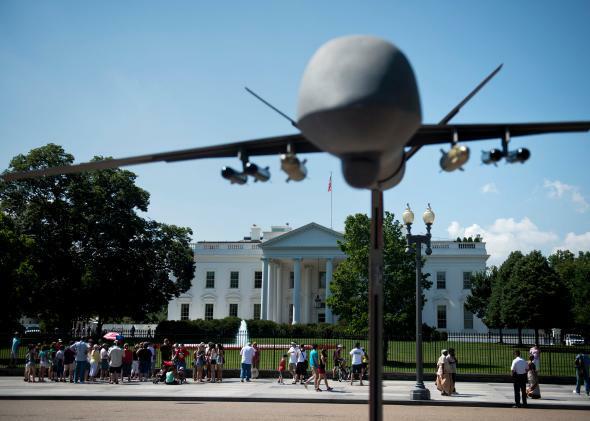 A model UAV displayed outside the White House during anti-drone rallies in June 2012. It’s going to be months, or probably years, before the Federal Aviation Administration releases drone regulations, but there are some things we know right now. You can’t fly drones in/over national parks, and you shouldn’t fly them too close to hawks. It’s also probably illegal to fly a drone onto the White House grounds, which I bring up because someone did. A spokesman for President Barack Obama said on Monday that a small drone was found within the walls of the White House compound. The drone didn’t seem to be a threat, but, as the New York Times reports, the Secret Service is investigating. The president and first lady are currently in India, but daughters Sasha and Malia are in Washington, D.C. The situation is surprising—or not surprising—given criticism of the Secret Service in recent months. One major lapse involved an intruder who jumped the White House fence and got all the way inside the building. Quadcopters and other small drones may not have been viewed as a threat in securing the airspace over the White House. That should probably be reconsidered now.